This is true. Blunt, but true. Why do we write? I meant to ask my students this question during our first class, but I realized I don’t have an adequate answer for them, or that my answer is too all-encompassing to be much of an answer at all. I write because it’s my way of connecting with the world. Writing is my assault on the silence of living without conviction in a world that’s dead-set against it. It’s my way of finding out who I am and what I’m willing to stand for. It’s what I do because I don’t know how to do anything else. it’s what I do because I don’t know who I would be if I didn’t. But more than that, I write because the world needs frivolity. Would we die without poetry? Would we cease to exist without books? I’d like to say I would, but I’m not that naive. My writing won’t cure cancer or solve world hunger. It won’t help make my food taste better, my hair stay red after washing or my car go longer in between visits to the garage. A poem a day doesn’t keep the doctor away. Art gives us a way to interpret the sunrise. When we hear a piece of music that reverberates in our bones or see a photograph that brings tears to our eyes, we are alive. We are real. We connect to the artist because we both think that what that person painted, wrote, photographed, sculpted or played is beautiful or horrible or true or whimsical or just achingly necessary, and that brings us together. As a species, we are unified by what we universally understand on the most basic cellular level, and that is art. We are, each of us, a little piece of the art that is living and breathing in the world. We don’t live on art, but I think all of us, whether we know it or not, do live for it. So that’s why I write. Because art it is what I am, and I hope it is what you are, too. 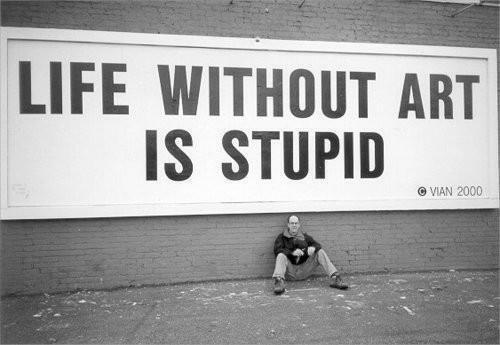 Life without art is stupid. Don’t subsist on stupidity. Previous Who owns art, anyway? Next Sometimes writing is alchemy. Sometimes it’s a coal mine.